Kinetic and efficient, Premium Rush embraces its b-movie aesthetic with vigor as it navigates through the city streets of New York, weaving in and out of traffic while adopting a deadline narrative that spans the globe. So much of the film just goes – it has the speed and awareness to realize that the its flimsy plotting is best to only be brushed upon. While I may question its many odd narrative detours, the picture supplants exposition for intense chase sequences that have the economy to feel grounded and always convincing. Few films this year possess the simple appeal of having interesting characters, good actors, and visceral delights in one neat package quite like Premium Rush. The likeability factor is crucial to Premium Rush’s success. Much of the dialogue of the film could be misconstrued as smarmy or self-aware, but in the hands of actors like Joseph Gordon-Levitt and Michael Shannon, there is an aura of plausibility to many of their actions. The picture is truly impeccably casted, down to Daily Show correspondent Aasif Mandvi as the bike courier’s lead dispatcher. Despite some cumbersome material, the cast is capable of evoking empathy, providing the film’s several cycling sequences to carry unprecedented weight and significance. It’s a simple technique that just so happens to work out because the actors serve the material well. And those cycling sequences are something to behold. As a cyclist in Chicago, portions Premium Rush resonate with my own personal experiences of dealing with urban commuting. Writer/director David Koepp has a firm grasp of the treacherous urban environment and realizes it with impressive accuracy. His utilization of a technique that involves Levitt analyzing his surroundings, looking into the various paths he can take to avoid potential disaster, is a simple but an effective novelty trick that gives the material an added dramatic pull. Perhaps most of all, the film simply appeals to a niche group that I so rarely see in films. While Koepp adheres to typical action film conventions throughout most of Premium Rush, his ability to tweak the formula to work for his cyclist framework gives the whole genre a crucial sense of freshness. There’s a palpable aura of ingenuity to Premium Rush that might seem ridiculous at first, but once those wheels start going, you’re quickly engrossed in all of its ridiculousness. 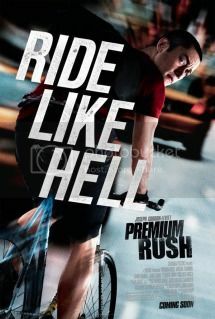 Perhaps purely a novelty success, I can’t go against my gut on sheer intensity Premium Rush provided me.